The Mechatronic CNC Mill Training System (87-MS8M60) allows learners to use a Denford CNC Micromill in conjunction with Amatrol’s Mechatronics Servo Robotic Assembly Station (87-MS5-P2). This combination provides hands-on practice for incorporating machining and CNC Mill integration within an automated lines process. In addition to integrated automation/machining skills, learners will study about CNC programming fundamentals. Because CNC mills are used to create a variety of parts and components, learners entering the manufacturing industry will find this learning system’s hands-on practice and real-world skills invaluable. 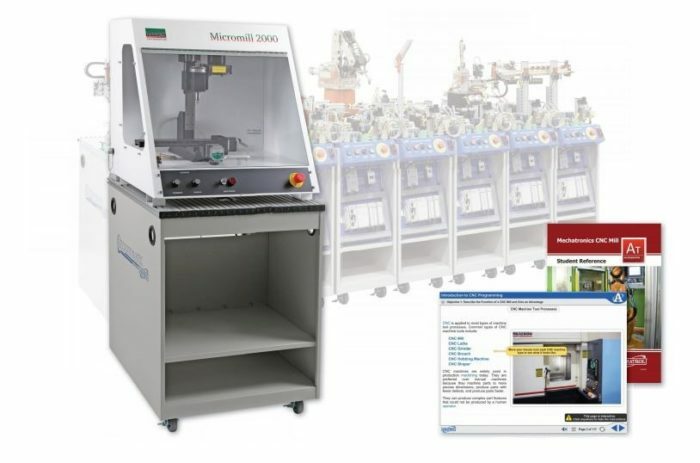 This system includes a variety of real-world components including a Denford Micromill, mobile workstation, electro-pneumatic vise with filter/regulator, tooling package, robot-to-CNC interface, and an electro-pneumatic chip blower. The 87-MS8M60 also features world-class interactive multimedia curriculum, an install guide, and a student reference guide. When integrated within a mechatronics line, a CNC mill creates a highly efficient process for making precise parts that can be assembled further down the automated line. Specific to this learning system, the Servo robot on the Mechatronics Servo Robotic Assembly Station will load valve bodies into the Denford CNC Micromill where the valve body can have a design engraved on its side, have the mounting holes enlarged, or whatever is programmed by the learner. When the micromill’s process is complete, the Servo robot will unload the valve body and return it to the Mechatronics Servo Robotic Assembly Station. The most prominent component included with 87-MS8M60 is the Denford CNC Micromill. The Micromill is a compact 3 axis milling machine with variable spindle speeds and feedrates which make it ideal for cutting a wide range of synthetic materials. It also features a removable door panel to allow robot loading and unloading, discrete I/O to communicate with robot, and USB I/O to communicate with a PC using the Denford CNC Micromill programming software. Learners will study basic CNC programming, CNC mill safety, and the fundamentals of operating a CNC mill before moving on to more advanced topics such as using a robot to load and unload parts and how a CNC mill can be effectively integrated into a mechatronics line. Additional topics include: linear interpolation, startup and shutdown blocks, tooling selection, locating zero, absolute and incremental positioning and circular interpolation. This curriculum is presented in a highly interactive multimedia format that features 3D animations, video, text with audio voiceovers, and quizzes. The 87-MS8M1 includes all of the content and skills included with the 87-MS8M60, but excludes the Denford CNC Micromill. This allows customers access to Amatrol’s world-class curriculum and hands-on skills that already own a Denford CNC Micromill but want to teach CNC/automation integration skills. A sample copy of the Mechatronics CNC Mill Learning System’s Student Reference Guide is also included with the system for your evaluation. Sourced from the system’s multimedia curriculum, the Student Reference Guide takes the entire series’ technical content contained in the learning objectives and combines them into one perfect-bound book. Student Reference Guides supplement this course by providing a condensed, inexpensive reference tool that learners will fi nd invaluable once they fi nish their training making it the perfect course takeaway.